1 week from 6th February 1965. Detail : The Beatles sixth official E.P. 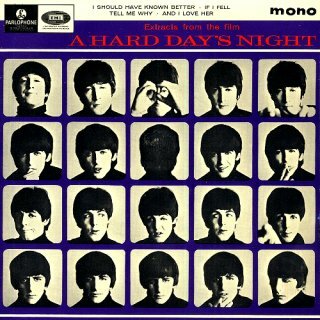 "Extracts from the film A Hard Days Night", and was the first of two E.P. 's with tracks from the latest L.P.
What this E.P. 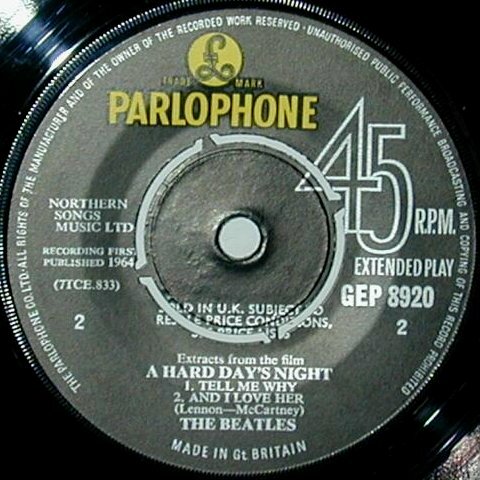 also provides is that, every track on side one of the album, except "I'm Happy Just To Dance With You" was available on 45rpm format in 1964 ! With these two E.P. 's from the album, EMI were once again trying to get as much mileage as possible from The Beatles output. But neither this E.P. nor any until Magical Mystery Tour broached the top 30 singles chart. The E.P. using the cover art from the album, reached No.34 in the singles chart. Of course in the E.P. chart it was yet another number one for the fab four. The E.P. had sleeve notes by Tony Barrow. 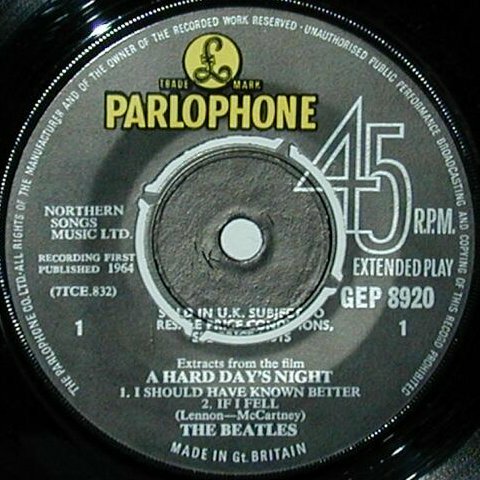 Around the edge of the label, the words stating the rights of the publishers started with "The Parlophone Co. Ltd." and the date on the label is shown as "Recording First Published 1964". Across the press-out centres are the words, "sold in U.K. subject to resale price conditions, see price lists". 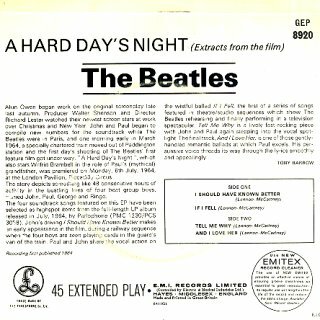 Post 1965 pressings, the rights start with "The Gramophone Co. Ltd.", and the date is not preceded with "Recording First Published", but instead has a circled "P". 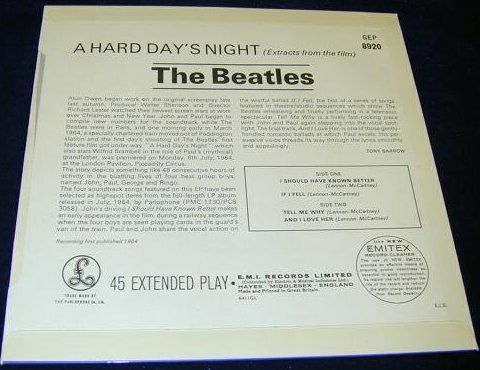 Re-pressings were also made in the 1970's, these do NOT have across the press-out centres the words, "sold in U.K. subject to resale price conditions, see price lists".